D.L. Parsell, Maya Hieroglyphs Recount "Giant War"
Newly translated inscriptions at an ancient pyramid in Guatemala suggest that the Maya civilization, at its peak, was dominated by two powerful city-states that engaged in a protracted superpower struggle. 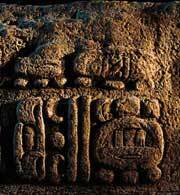 Stone hieroglyphs are exposed on the stairs of an ancient pyramid at the Maya ruin of Dos Pilas. Translation of the glyphs reveals the story of a superpower conflict in the seventh-century Maya world. The project has been funded in part by National Geographic, Vanderbilt University, the Foundation for the Advancement of Mesoamerican Studies and Guatemala's Ministry of Culture. The evidence comes from hieroglyphs on a building at Dos Pilas, a relatively small but strategically important Maya kingdom now partly obscured in dense rain forest. The inscriptions, which appear on the staircase of a Maya pyramid dating from the seventh century, are one of the most extensive Maya texts ever found. The texts show that Dos Pilas played a major role in fierce and bloody warfare that raged back and forth between the major Maya cities of Tikal and Calakmul for a century, until Tikal finally prevailed in about A.D. 695. The inscriptions offer strong evidence supporting a theory proposed a decade ago by two Maya experts who challenged the prevailing belief that conflicts in the region were mainly local clashes between independent city-states. In their alternative interpretation, Simon Martin and Nikolai Grube proposed that these campaigns reflected a larger struggle between major powers. Arthur Demarest, a professor of anthropology at Vanderbilt University in Tennessee who organized the translation of the newly revealed glyphs, said their content has convinced him, after years of skepticism, that Martin and Grube were right. Rather than being an independent actor, as previously thought, it now appears that Dos Pilas was a pawn in a much bigger battle, said Demarest. In today's terms, Dos Pilas was the Somalia or Vietnam of the Maya world, used in a war that was actually between two superpowers. Some of the inscriptions at Dos Pilas first came to light years ago. The glyphs describe repeated clashes between Dos Pilas and Tikal, a successful attack on Tikal by Calakmul, and eventually a great defeat for the king of Tikal. Information about these events was fragmentary, however, and many questions were left unanswered. Two years ago, a storm blew through Dos Pilas, knocking down a tree and exposing ten more steps, which have provided a much more complete picture of events. Federico Fahsen, a Guatemalan expert on Maya glyphs, headed a team that traveled to Dos Pilas last year to excavate the steps and document the inscriptions. The hundreds of new glyphs fill in a vital 60-year gap of unknown Maya history and clarify many of the political and military relationships of this critical period, said Fahsen, an adjunct professor at Vanderbilt. Demarest added, It's rare that you find a new monument and it fills in such a large blank spot about the history of a region. One of the biggest mysteries the inscriptions answered was the nature of Dos Pilas's relations with Tikal and Calakmul. Tikal (known at that time as Mutul) was located in what is now northern Guatemala; Calakmul was about 60 miles (97 kilometers) further north, in Mexico. Dos Pilas is about 70 miles (113 kilometers) southwest of Tikal. Many scholars have thought that any alliances between Maya kingdoms were weak associations between entities that were essentially autonomous. Thus, the researchers were surprised to discover from the new inscriptions that Dos Pilas was conquered by Calakmul and became its puppet state for many years. When I read those glyphs, I had to blink to make sure I was reading it correctly, said Fahsen. I had never heard of Calakmul actually invading and defeating the king of Dos Pilas. We thought that, at most, they may have had a weak alliance of some type. The text also forced researchers to revise earlier assumptions about the conflict between Dos Pilas and Tikal. This had previously been known as only a domestic quarrel between two brothers. Now we know it was part of a more global conflict between Tikal and Calakmul, in which Dos Pilas played a part, said Fahsen. Like U.S.-Russian fighting by proxy, he added, this introduces the whole concept of a sort of global fighting in the Maya civilization. Dos Pilas was first established in A.D. 629 as a military stronghold of Tikal. Dos Pilas was important to Tikal and later to Calakmul because it strengthened their clout at the southern edge of the Maya lowlands, which was a major gateway for trade. Precious goods such as jade, obsidian, quetzal feathers, and shells from the Caribbean flowed between the highlands and lowlands via the region's Pasón River. When Dos Pilas was founded, the ruler of Tikal installed his four-year-old brother on the throne. The glyphs include a detailed account of significant events in the life of this first king, Balaj Chan K'awiil, who lived to be about 60. The inscriptions show that Balaj Chan K'awiil became a young warrior and remained loyal to his brother and other members of the royal family at Tikal for years. But when he was in his 20s, Calakmul conquered Dos Pilas and the young king was forced to shift his alliances. Under the banner of Calakmul, K'awiil waged war against Tikal for a decade and eventually sacked the city-state, carrying its ruler?his brother?and other members of the nobility back to Dos Pilas to be killed. The text at Dos Pilas describes the bloodshed and the celebration that followed. The west section of the steps was very graphic, said Fahsen. It says, 'Blood was pooled and the skulls of the people of the central place of Tikal were piled up.' The final glyphs describe the king of Dos Pilas doing a victory dance. After the victory over Tikal, Dos Pilas embarked on a campaign of conquest with Calakmul's backing and became a major regional power until it collapsed in A.D. 760. Ideas about the Maya civilization and its political organization have changed steadily over the past several decades as scholars have acquired new evidence from archeological discoveries and translations of Maya texts. And the Maya superpowers theory, like all scholarship, will remain subject to debate and revision. Simon Martin of the Institute of Archaeology at University College, London, said that in the 1960's, most scholars viewed Maya cities as components of a small number of regional states. Then, as translations of Maya texts became available beginning in the 1980s, these cities were shown to be capitals of smaller kingdoms that were almost constantly in conflict with one another, but failed to create bigger and more stable states by conquest. To explain such a fragmented political landscape, many researchers assumed that Maya kingdoms were inherently weak. Martin said he and Grube regarded the prevailing ideas as implausible. For one thing, although there were a great number of small Maya states, the capitals of some were vastly larger and more populous than others. More important, Maya inscriptions indicated that some kings were owned by other kings from bigger and more successful cities or were crowned under the supervision of rulers from dominant kingdoms who evidently had established themselves as regional hegemons. Martin said that when he and Grube compared this evidence with records of warfare in the region, there was a strong correlation between militarily successful cities and those sanctioning and installing other rulers. We took these structures and charted them, building a database that suggested there was some kind of greater shape in the ways that Maya kingdoms were organized, he said. Scholars don't know how much the constant warfare between city-states may have contributed to the eventual collapse of the Maya civilization by A.D. 900, although most agree that it was probably a significant factor. Demarest thinks the warfare described in the Dos Pilas inscriptions may reflect a period when the Maya civilization was on the verge of moving to a higher level of organization and consolidating into a single empire. However, this didn't happen, he said. Instead, the giant war went back and forth, he explained. After Tikal was sacked, it eventually roared back and crushed Calakmul. And then the Maya world broke up into regional powers, setting the stage for a period of intensive, petty warfare that finally led to the collapse of the Maya. David Stuart, a Maya hieroglyph expert at Harvard University, said the conflicts recorded in the seventh-century inscriptions at Dos Pilas did not lead directly to the abandonment of Maya cities, which happened much later. But it's true, he said, that warfare is a big issue in Maya history, right up to the time of abandonment, although I think something catastrophic, whether environmental or what, played a major part. The information on the staircase at Dos Pilas is important, said Stuart, because it gives us an idea of how bad things were?of the warfare and intrigue that was going on. It shows that these couldn't have been very happy times. The discovery of the glyphs at Dos Pilas is reported in the October 2002 issue of National Geographic magazine, and aired on the National Geographic U.S. cable television program National Geographic Today. National Geographic supported this work along with Vanderbilt University, the Foundation for the Advancement of Mesoamerican Studies, and Guatemala's Ministry of Culture. Join the world's largest nonprofit scientific and educational organization, and help further our mission to increase and diffuse knowledge of the world and all that is in it. Membership dues are used to fund exploration and educational projects and members also receive 12 annual issues of the Society's official journal, National Geographic.